Colorectal cancer (CRC) is a significant and preventable disease, yet rates for screening to detect the disease remain low. There are several CRC screening options for patients to choose from depending on their preferences. Incorporating patients’ preferences into CRC screening decisions has been advocated by the United States Preventive Services Task Force, and others. In response to this need, CanSORT investigators worked with the Center for Health Communications Research to develop Decider Guider: A tool to assist you in making an informed choice about colorectal cancer screening. 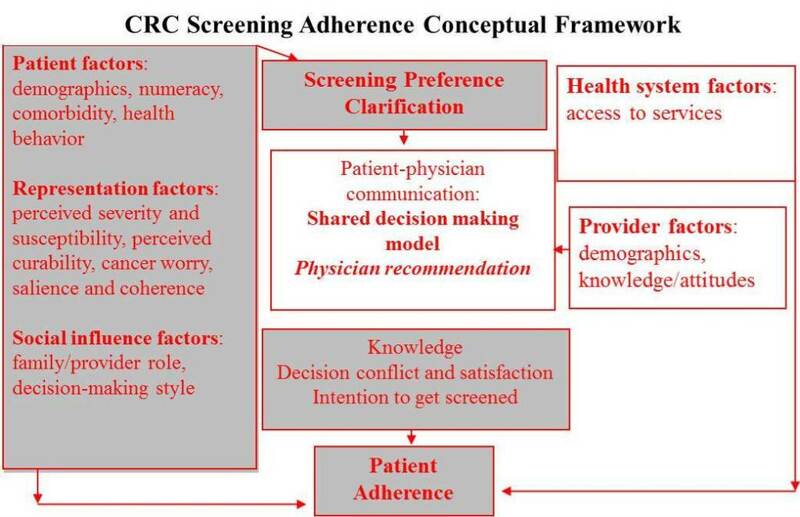 This online tool was used to help improve adherence with CRC screening at two racially and ethnically diverse primary care settings in Detroit and San Francisco. Surveillance is also important after treatment for colorectal cancer – ongoing surveillance is needed to detect cancer recurrence. Roughly half of all colorectal cancer survivors fail to receive this potentially life-saving surveillance. Engaging the partners of colorectal cancer patients may represent one approach to improving cancer surveillance. Partners serve as a potential resource that providers can engage in order to increase patients’ receipt of surveillance. Preliminary research shows that 80% of colorectal cancer patients want their partners involved in treatment decisions and 85% report high levels of partner support. CanSORT’s Dr. Christine Veenstra has received a K07 award from the National Institutes of Health entitled “Partner Engagement and Receipt of Surveillance in Colorectal Cancer Survivors”. This study is a mixed-mode study that aims to identify factors that influence receipt of surveillance testing from both the patient and partner perspective, to determine the partner-specific factors associated with a high level of partner engagement, and to determine the relationship between level of partner engagement and patients’ receipt of surveillance testing. It will involve patient, partner, and dyadic in-depth interviews as well as a large-scale survey of colorectal cancer survivors and their partners.